But onto the FOOD. I am obsessed with banana bread. Banana bread makes me think of my mom. She makes THE best banana bread. So I spend my days trying to create an alternative that I can snack on every single day that would make her proud. 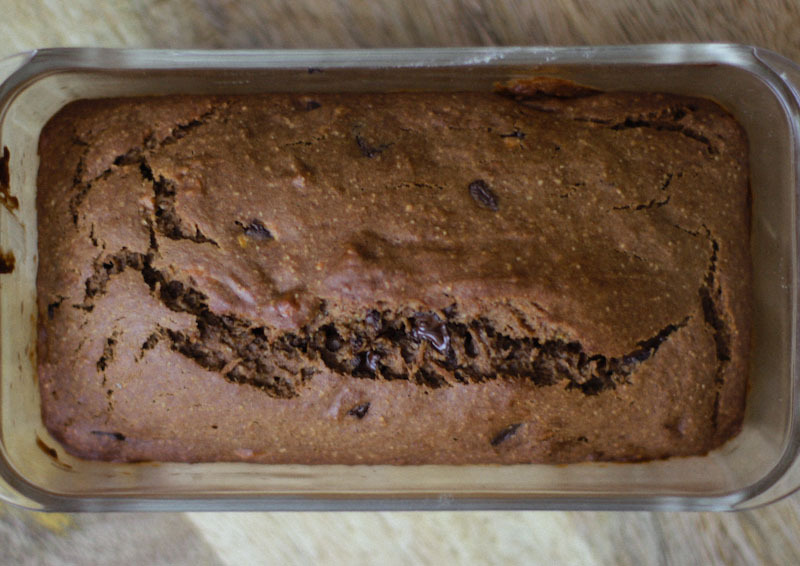 I already have a really good gluten free banana bread on the site, but THIS time amped it up with plenty CHOCOLATE and nutty almond extract. This recipe has a bit more depth and almost resembles a snacking cake (which is never a bad thing, is it?). It's SO delicious. The better quality the chocolate here, the more depth the bread will have. Enjoy this for brekky, as a snack or a healthy(er) dessert! Preheat your oven to 350°F. Grease (and flour) both loaf pans. In a large mixing bowl, whisk the gluten flour, cocoa powder, baking soda, baking powder, salt, and espresso powder. In a medium mixing bowl, combing the together the maple syrup, olive oil, eggs and bananas with an electric hand or stand mixer for three minutes. Add the almond and vanilla extract and mix to combine. Add the wet ingredients to the bowl of dry ingredients and mix together until just combined. Fold in the chocolate chips.